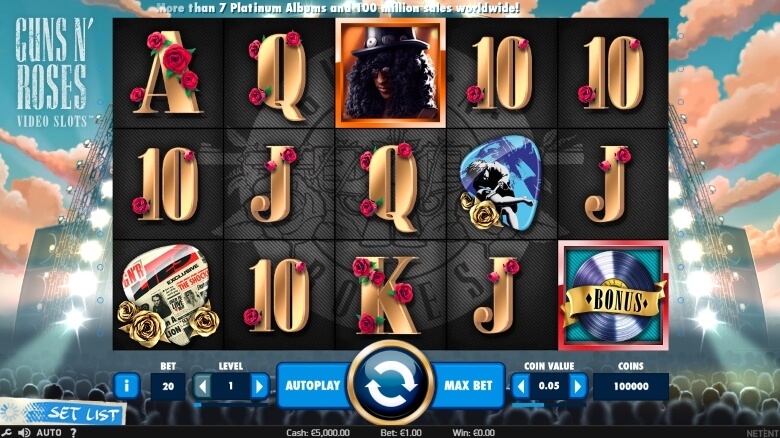 Guns ‘n’ Roses video slot from NetEnt gives you the chance to not only enjoy playing a great slot game with high-quality graphics, animations and sound but the chance to rock out with this legendary group. With a choice of 5 songs from the set list, you can spin the reels whilst listening to a classic rock song. Choose from ‘Welcome to the Jungle’, ‘Sweet Child O’ Mine’, ‘Paradise City’, ‘November Rain’ or ‘Chinese Democracy’. When playing on a PC you get the full benefit of the animated graphics with the game themed around you being at one of Guns ‘n’ Roses concerts. A moving crowd of fans can be seen in the background jumping into the air with excitement as you achieve a win. This is a really highly polished slot game. Guns ‘n’ Roses Slot by NetEnt is a 5-reel, 3-row, 20-line video slot which features Wild substitutions, Expanding Wilds, the Appetite for Destruction Wild, a Bonus Wheel, Bonus symbols, Encore Free Spins, Legend Spins, a Solo multiplier and a Crowd-Pleaser Bonus Game. The reels themselves have a faded Guns ‘n’ Roses logo behind them and the symbols are very well designed. The standard 10, J, Q, K and A symbols are all gold coloured with a single rose attached to them. There are members of the band, various guitar plucks, an expanding wild symbol with an animated swirl of gold and roses and vinyl records. The game has 7 coin value setting from 0.01 up to 1.00 and 10 levels. This means you can spin the reels from as little as 20p up to a maximum of £200 per spin. The game has a maximum win of 750 coins for the Axl Rose symbol, which is then multiplied by any applicable multipliers. Initially, you are shown an intro of Guns ‘n’ Roses clips from some of their gigs with Sweet Child O’ Mine playing over the top and the game logo floating into view. Once the main game has loaded, you will see the set list of songs in the bottom left of the game where you can choose the music to listen to whilst you play. This is great at first but can become a bit repetitive if you play for a long period of time. However, it certainly does help immerse you into the game and creates a great atmosphere for play. On the bottom of the game on the right-hand side, you can set your coin value per spin. On the opposite side, you can set the level of play. Level 1 with a 0.01 coin value equals a 20p bet per spin as there are 20 fixed pay lines. At level 10 with the maximum coin value of 1.00, you will be high rolling at £200 per spin. We suggest you set your stake at a level you can comfortably afford so as to enjoy playing the game. You can then spin the reels using the blue coloured button in the centre of the bottom part of the game. There is also an Auto Play button and a Max Bet button to instantly bet the maximum. The auto-play feature allows you to set anything between 10 and 1,000 spins. The Guns ‘n’ Roses video slot has an abundance of features. You have Wild symbols that can appear on any reel and substitute for all symbols except Bonus symbols. These Bonus symbols (Vinyl Records) can appear on reels 1, 3 and 5 and will randomly award one of 3 bonus feature games. You will get a spinning Bonus Wheel which you need to click to stop to then see which feature you have been awarded. these can be Encore Free Spins, The Crowd Pleaser Bonus Games or Coin Wins. The Encore Free Spins will activate ten free spins. Here a band member symbol will overlay on reel 2, 3 or 4 and act as a wild symbol on all of the free spins. The Crowd Pleaser Bonus Game gives you the chance to pick up to 3 symbols and win awards of coins or free spins. There are 3 levels within the bonus game with 60 coins need on level 1 to get to level 2. You need 300 coins on level 2 to get to level 3 where you can win up to 800 coins. However, hit the maximum and this figure will be doubled. If you get Coin Wins then these will be displayed on the Bonus Wheel. Other features in the game include the Appetite for Destruction Wild which can appear randomly and is overlaid on the reels in the shape of a cross. This will substitute for all symbols and pay the highest win possible on that spin. There is also a Legend Spins feature that again is randomly awarded. 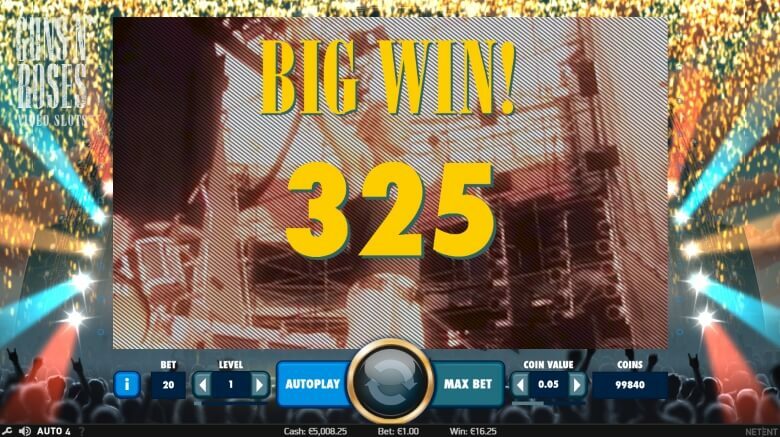 Here, band members will appear overlaid on the reels as wilds and 2 re-spins are awarded and the highest wins being paid. Another random feature is the Solo Multiplier where your win on any bet line could be multiplied between four times and up to 10 times as much. On the very bottom bar of the game on the left, you will see several other options including a question mark, auto, volume control and settings. The question mark gives you information about the game and the settings allow you to make the game have a quick spin, remove the intro or set your keyboard’s space bar as your spin button. It is always best to get to know a game first and that includes what you need to achieve a win and what the features are. Although we have described them in this review we would suggest you check out the game information before you play. Click the ‘i’ symbol on the game to review the game information, pay-table structure, pay-lines and features. Selecting the question mark symbol will show you the game rules along with a further outline of the game features, the game functions and controls, game terminology and more. If you can, try and get to play the game in demo mode first. This way you will become familiar with all the features before playing with your own cash. When you do revert to real funds, then initially play at the lower levels and coin values so as to get a good play out of the game and build your confidence in the game. You can play Guns ‘n’ Roses online slot for free at NetBet Casino and ComeOn Casino. Is Guns ‘n’ Roses the right video slot for you? Whilst testing out this video slot the wins came in on a fairly frequent basis especially with the wild symbol kicking in on many occasion to generate the win. The game is a low to medium variance game with the chance to win small amount with just 3 symbols often. This is balanced with the chance to win larger prizes especially with the number of multipliers involved combined with the level set at the maximum of 10. Although not life changing amounts, there are still some big wins to be had. The game has a good theoretical RTP (return to player) of 96.98% giving a house edge of just 3.02%. This means you should see value for money when playing this video slot and will help in turning over any wagering requirements from free casino bonus money. In summary, the Guns ‘n’ Roses video slot is a top quality game from NetEnt and is proving a big hit with players. The combination of rock music and gameplay mixes extremely well together and the animations enhance the experience even more. Add to this the frequency of wins based on a good TRP means it is well worth a try whether you are a fan or not of the group Guns ‘n’ Roses. Use your i-Phone or i-Pad to play roulette, blackjack and slots on the 888Casino iOS app. Enjoy great mobile versions of top casino games, slots and more by downloading and installing the 32Red Casino IOS App for your iPhone or iPad today! Get the best of Betvictor Casino’s variety of online casino games on the BetVictor iOS app. Use your iOS device to play roulette, blackjack and slots at Coral Casino. Available on i-Phone and i-Pad. Get access to great online casino games on your i-Phone and i-Pad with the Gala Casino iOS app. Get online casino games on your i-Phone & i-Pad with the Sky Casino iOS app. Play slots, Roulette and Blackjack online. Use your i-Phone or i-Pad to play at Paddy Power Casino via the mobile website or on a dedicated Paddy Power iOS app. Play online casino games on your i-Phone or i-Pad with the Betfred Casino iOS app. Get access to a great range of games including blackjack, roulette, sots and more! Get sign up offers & casino bonuses from one of the top UK online casinos on i-Phone & i-Pad with the Ladbrokes Casino iOS App. © CompareFreeCasino.com 2015. All Rights Reserved.